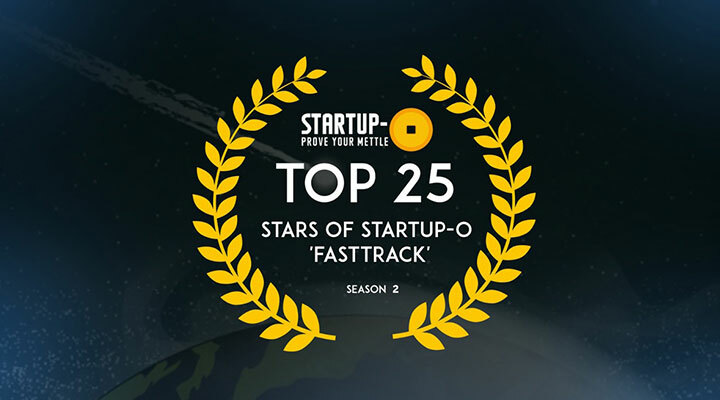 Congratulations to the Top 25 startups from Startup-O ‘Fasttrack’ Feb- Mar 2017 Season. These were shortlisted from among the 112 startups that registered for this season. Final 59 startups participated from across 11 countries and 10 tech categories. ARTO is the newest and easiest way to discover and buy art straight from your phone. Instead of searching for art we will recommend it. Our app shows you art images which you can swipe left and right to indicate if you like something or not. The more you swipe the better we understand your art taste and preferences and the better our art recommendations. Unlike our competitors, who only have a limited number of artworks and where you have to browse and search yourself for an art piece, we differentiate ourselves by focussing on a mobile experience and the art recommendation. Don’t search, ARTO recommends art that fits your preference and taste. Attores helps certificate issuance bodies who need to digitize their certificates by offering a digital certificate issuance platform that allows quick and easy blockchain enabled certificates. It also allows the recipients to share their accomplishments and memberships socially. Unlike our competitors, we are decentralizing the issuance and storage of certificates, allowing students to own their certificates. BookMyStorage is a digitally managed marketplace for end to end warehousing requirements. It provides a one-stop solution for warehouse leasing, Flexi Storage and on-demand model for storage, fulfillment and value-added services such as labour, security, transportation, technology, insurance, infra, and utility provision. Unlike our competitors, who are not experts in warehousing and also unorganized and fragmented, we are providing end to end warehousing solution and reducing customer cost of operation by 20% with our Flexi offering and reduce cost/time for leasing 35%. Curio is developing a platform for spoken audio that helps busy and curious people stay on top of ideas and stories that matter, by offering them carefully selected content from top publications as immersive audio narrated by professional voice actors. Ferosh helps urban upwardly mobile, busy women in Vietnam with easy to follow, search and buy high-class fashion design clothes and accessories. It keeps them in the know with latest offers, styles & collections. High fashion on your fingertips. Unlike our competitors, we are first in Vietnam to provide fashion design clothes, high-class product quality and newest trends and collections to discerning women. We help IoT developer who need sustainable power solution for IoT devices to reducing the electricity-maintain issues by offering a photovoltaic technology that allows the devices to have beautiful outlooks and keep function in extreme environments(acid, alkali, chemical solvents etc.). Unlike traditional PVs, we have unique properties on easy shapeable, colorful (even transparent), outstanding flexibility, and our Eco-friendly and bio-compatible material is asking for a pure green future. Godamwale helps market warehouse to retailers, e-Commerce companies, industries and small businesses. We are for warehouses what AirBnB is for the hotel industry. Extra space by industry can be rented out to businesses who are looking to lease space for the short term, by offering a web/mobile solution to book warehouses that maps all warehouses/cold storages across India. It makes it easy to view, select fast and to book seamlessly. Unlike brokers who are unreliable and classified sites where the information is not up to the mark. GolfConnect24 helps to better connect different players of golf industry viz Golf courses, Golfers, Tee Times, Tournament organizers and retail products. It is seamless and easy to use application that is a one-stop shop for connecting with other golfers and anything related to the game. Unlike traditional booking agencies, we are able to directly connect golfers with golf courses 24/7 to book and confirm the tee times. Good Meal Hunting creates job opportunities for talented home-based cooks through an online food marketplace. We handle all the technical aspects of running their business such as providing an online platform, coordinating with payments, deliveries, and marketing so that they can concentrate on the most important part: the food. Unlike our competitors that provide an on-demand food delivery service thru restaurants, we are creating job opportunity for home-based cooks and food entrepreneurs who are talented in their craft and need the empowerment to pursue their passion for cooking. HaloHola is an Indonesia based travel entertainment startup that enables long distance transportation passengers to stream entertainment content on their personal devices, without costing them any data, and works in places where there’s no internet nor signal coverage. HaloHola goal is to bring the experience of in-flight entertainment to smartphones in every mode of transport, making the travel experience much more enjoyable. Unlike our competitors or traditional TV set on board entertainment, we are providing a service that works with no signal and no internet area, zero data cost, and no buffer. Lokadoc helps healthcare professionals who need to manage their doctor-patient schedule on daily basis by offering a schedule management system that provides booking online and offline. It has rich features like appointment follow up using automated SMS. Unlike our competitors, we are more advanced with auto SMS confirmation, waiting list and many more rich features that makes us suitable for clinics as well as hospitals across Indonesia. Magpie helps merchants with payment collection concerns by offering a super easy mobile payment system that allows them to collect payments from anyone with a Visa and MasterCard credit or debit account. Unlike current online payments in the Philippines that combine digital and manual steps to fulfilling payments, we are user-friendly, convenient and available every time, everywhere. MedLabz helps patients who need evidence-based diagnostics testing by offering an enhanced quality of home testing services that allows them to get reliable reports at affordable prices in comfort of their home/office. Unlike our competitors, we are more accessible, timely with better pricing model and providers of best home collection experience. One of the biggest pain-points for offline retailers are the checkout queues, which ruin the customer experience and cause abandoned carts, especially on weekends. Perpule provides a GPS-enabled app to identify a store and enable self-checkout. Customers scan the barcodes of items they pick off the shelves, get prices and offers, and use a payment gateway to complete the transaction. The app brings to offline retailers some of the online world’s cool features, such as customer profiling and product recommendations to drive more sales. Unlike our competitors, we are able to get clients on board faster, as our technology could be integrated with any back-end database platforms in the world and an easy-to-use mobile application for shoppers. PsyQuation helps traders make more profits. Why? Because traders make mistakes – our database suggests 75% of retail FX traders “blow-up” in 6.5 months which is bad for the trader, broker and the allocator of trading capital. How? Our proprietary software solution identifies where traders are making mistakes, providing alert notifications and rectification suggestions, along with positive alerts. Backtest results show +30% more profits on average for traders who follow PSY suggestions. By increasing the profitability of a trader we increase the life time value of a trader to a broker. Our simulated model results suggest we increase the lifespan of a trader by an additional 50% & commission by +70%. Unlike our competitors, we are Competitive advantage skill, experience, past success, proprietary data, 19 contracted brokers, 6 committed allocators, committed research professor collaborator, intraday equity curve, skill score. R2 Robotronics helps large enterprises who need help in deploying drone swarms for automation by offering a service to operate their drones over our cloud that helps them deploy, manage, and handle data processing completely autonomously, without any pilots. Unlike our competitors, where you need to deploy skilled pilots with handheld remote, we are cheaper, far more efficient and open to integration in API. Raydar is an intelligent stock photo search engine for creatives that cuts down >50% of search time. Unlike our competitors, we are a wider collection of brands (15 more brands) under one roof, with a cheaper on boarding pricing plan. SAUCEink is a magazine + social commerce (shopping) platform to discover and shop for things you love. We provide our members (consumers and brands) an easy means of creating their own website, blog, e-commerce store, etc. ; and reach users immediately. We aim to ease consumer’s decision-making process and aid brand owners in automating their business and marketing. We help brand owners understand their customers and connect them while creating great experiences. Unlike our competitors, we are more focused on presenting targeted goods and services to the right audience/consumers to increase the conversion rates. Skipmenu helps callers see service options so they don’t have to listen to ‘press 1 press 2’ prompts, which helps companies qualify incoming calls and overall reduce their customer support expenses. Tauro Wealth is a comprehensive, technology-driven investment platform for Indian retail investors. Unlike most competitors who simply redistribute mutual funds, we have developed our own financial product in the form of long-term stock portfolios using proprietary algorithms. We provide a rich set of features, tailored advice and seamless execution at a fraction of traditional costs. Unlike traditional investment products like mutual funds, we are much more consistent in terms of returns and much cheaper. Taxumo makes it easy for every Filipino small business owner and professional to prepare and pay their taxes! With Taxumo, you can, Track Income and expenses online, Autofill your tax paperwork, Pay tax dues anytime, anywhere. TempoGO is an IoT plus SaaS solution for the transportation sector. Our platform connects Vehicles, People, and Trips. And dramatically improves the productivity of a commercial vehicle fleet, either passenger or freight. The TempoGo technology is geo-agnostic. As capable of being deployed in a bus operator in Vietnam as for a freight transportation company in India. Every company that owns or operates a fleet of over 25 vehicles—either for its own use or as a commercial transportation offering—is a potential client for TempoGO. Freight transport companies, Logistics Companies, Distribution-centered companies that manage their own fleet, Inter-city bus or taxi operators, Corporate bus or employee vehicle fleets, Government Transport buses, School or College bus fleets. Unlike our competitors, we are modular, cheaper and cater to a broader customer segment. Tralulu helps active travelers who seek for local authentic experiences by offering a marketplace of local guides that allows travelers to book a local guide in Southeast Asia. Unlike our competitors, we are highly customizable to the preferences of the travelers in terms of itinerary, budget, and logistics. Uploan helps underbanked individuals who are currently struggling with high-interest rates from black market lenders as well as employers and investors by offering an online salaried loan marketplace that provides salaried loans by partnering with employers (B2B2C) and offering the loans up to investors to finance. Unlike commercial banks and black market lenders, we are 100% online providing loans that are 500bp cheaper to the borrower and returns 10X better than term deposits to the investors. We at Zyllem understand the complexity that lies beneath your logistics network. Our goal is to provide you with a single platform that lets you manage, control, connect and visualize your entire distribution network and processes – bringing together your own assets and logistics partners locally and worldwide – to serve your customers better.